ANGEL - GARDEN This item is on sale. 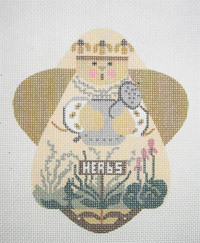 On #18 canvas this darling little herb and garden lady is perfectly stitch "painted" by computer. Imagine those wings stitched in Alicia Lace in a #4 bronze metallic, allowing the background to peep through to produce a very angelic and gossamer effect. BEFEWELED PACHYDERM This item is on sale. 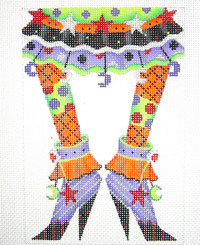 On #18 canvas to enhance the geometric detail, this very personable pachyderm is primed for prime time with an elaborate saddle blanket highlighting a star flower and moving gold fringe, jingle bells on his ankles and a tassel for a cravat. He is patiently waiting for you to adorn him with shiny metallics and take him with you to a SNL event on your shoulder as a purse flap. Size: About 8-1/4" x about 5"
BELLS - 1 This item is on sale. 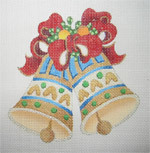 On #18 canvas, this trio of bells would elegantly grace your seasonal decor. What a chance! BELLS - 2 This item is on sale. 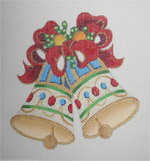 See description for Bells - 1. BELLS - 3 This item is on sale. BIRD OF PARADISE This item is on sale. 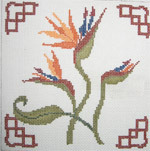 On #18 canvas, this really simple Bird of Paradise can be exquisite as an evening purse flap with a background worked in a small simple stitch with a metallic thread. The flower can stand out in the brilliant soy silks available today. Knock 'em out and knock yourself out with this price! BOX TOP - ACORN This item is on sale. Despite the picture, these oh so very small and portable box tops on #18 mesh are perfectly square to fit in little tiny ring boxes available from Romancing the Past. Or if you don't care for little boxes, what about a 3" or greater appropriately suitable mat in a simple oak frame? Think about teacher gifts! Size: Almost microscopic! 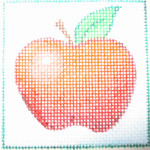 2.5" x 2.5"
BOX TOP - APPLE This item is on sale. 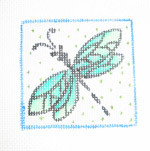 BOX TOP - DRAGONFLY This item is on sale. 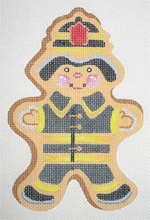 COOKIE - FORMAL FIREMAN This item is on sale. 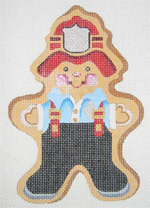 On #18 canvas, these gingerbread cookies can be finished as a cookie without loop or an ornament with the loop, for your favorite fireman or policeman. Each has a formal in dress attire and an informal in work attire, rendition. 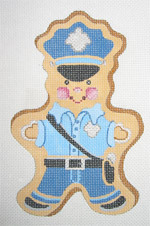 Size: About 6" x 4-1/2"
COOKIE - FORMAL POLICEMAN This item is on sale. 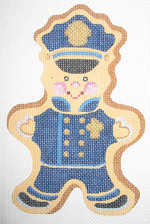 See descriptions for firemen or policemen cookies. COOKIE - INFORMAL FIREMAN This item is on sale. COOKIE - INFORMAL POLICEMAN This item is on sale. See descriptions for cookie firemen or policemen. CRAZY CAT This item is on sale. On #13 canvas, this is one of Jean Smith's most humerous designs. 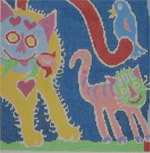 Her designs are always so vibrant and this one is especially so, with the crazy cat carring a tulip in his mouth. Perfect for a feline-lover! Don't let these kitties escape from you! 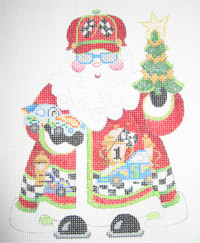 CUFF - JOY SANTA This item is on sale. This rather unadorned 9" deep cuff features a very welcoming Santa entangled in the word JOY. Like the other cuffs, it's designed to be a budget-saver, time-saver and an opportunity to engage your creativity for both the body of the stocking and the lining. He is really too enticing to reject; he hopes you don't! 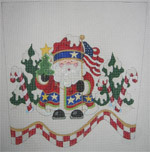 CUFF - PATRIOTIC SANTA This item is on sale. 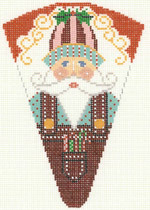 Like the CANDY CANE SANTA Cuff, this Santa is quite ornate too. Instead of carrying a candy cane, this guy totes the American flag. Same concept as #04185. Same opportunity too! 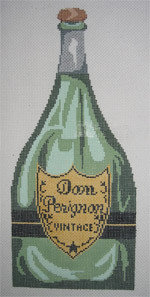 Celebrating an event like a golf championship, a house sale or a wedding, stitch this bottle of Dom Perignon to memorialize the occasion. On #14 canvas this would be a perfect opportunity to use an overdyed thread in long stitches to bring out the exquisite tints in the bottle. A gold metallic label, a petite very velvet ribbon, a heathered cork and you've got an event to remember long after the chanpagne is gone. Priced to sell so you can enjoy it without designating a driver! FALL WREATH This item is on sale. One of a quartet of wreaths designed by DEDE, this fall wreath, on #18 canvas to emphasize its detail, features oak and maple leaves interspersed with a variety of green yellow/gold and orange gourds. Lots of golds, bronzes and taupes, waiting for you to stitch in metallics and overdyes, silks and soys. NOTHING - NADA - NICHT comes from DEDE at this price! Size: About 9" in diameter. FRIENDS This item is on sale. On #18 canvas, what validates your friends better than being your BEST friend? 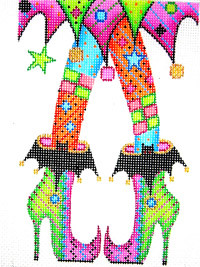 On #18 mesh, these are from a series of vertically rectangular canvases featuring funky legs and accessories to enable you to go wild with your creativity using funky threads, funkier embellishments and even funkier stitches. Purple is THE hue this year, so why not a really funky purple purse with a really funkier beaded strap and beaded fringe trim across the bottom? Don't be timid! See description for earlier Happy Legs. HEARTS - A This item is on sale. See description for HEARTS - E. For background colors think about a cotton candy or Pepto-Bismal for the left one and a claret for the right. With metallic designs, these will literally lunge! against a vibrant b/g. HEARTS - B This item is on sale. See description for HEARTS - E. For background colors think about a seafoam green, a watergreen or best of all, a grasshopper pie green! For the right hand one, what about a raspberry or a watermelon rose? HEARTS - C This item is on sale. See description for HEARTS - E. For HEARTS - C consider a fuschia and a butterscotch or ginger as a background. HEARTS - D This item is on sale. HEARTS - E This item is on sale. 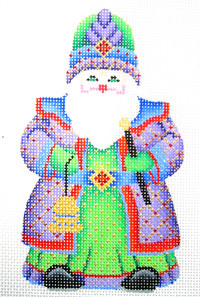 Size: About 4-3/4" x 4-3/4"
JUST LIBBY - JINGLE BELL SANTA This item is on sale. See description for "Howdy Santa." Threads called for include floss, overdyed floss, linen, overdyed cotton, braid, regular wool and assorted furs. 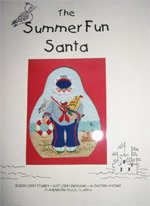 JUST LIBBY - SUMMER FUN SANTA This item is on sale. See description for "Howdy Santa." Threads called for include lots and lots of floss, perle, braid, overdyed cotton, velour and other specialty threads. LOVE IS GENTLE This item is on sale. After the violence of this weekend, we should take comfort in I Corinthians, chapter 13. On #18 mesh, this canvas depicts some of the characteristics of LOVE. On #18 count canvas, this little guy is just freezing to have you tuck in him a nice crisp dollar bill (or larger or even mucho grande larger!)stuffer. Line in optic white moire and back in a red or black velveteen to compliment the ice teal background. See description for Nite Lite Cover - Frog. On #13 canvas, this small lamp shade is scaled to fit a nite light which is included in the above prive. Shade is adhesive to enable stitched canvas, once blocked, to be directly adhered. You can jazz it up by adding appropriate fringe or cording. No finishing costs! 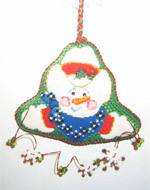 ORNAMENT - BELL SHAPED SNOWMAN This item is on sale. On either #18 or #13 canvas, this quirky little snowman makes up into a bell shaped ornament with attached lights embellishment. See photo nearby. ORNAMENT - BELL-SHAPED SNOWMAN - RED This item is on sale. See description for blue bell-shaped snowman. ORNAMENT - HEART This item is on sale. On #18 canvas this heart-shaped ornament screams for a shiny red and purple Panache, gold braid, atwisted hanging cord and your tree! Or maybe a teacher! 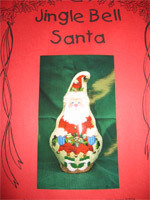 Size: About 4" x 4"
ORNAMENT - SANTA w/HEART This item is on sale. On #18 canvas, this quirky snowman with a dangling heart can be used as a tabletop figurine with weighted bottom or a cameo-shaped ornament. 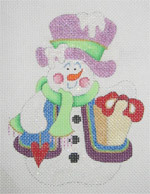 Snowman's body would shine if stitched in a sparkly thread like Snow or a pearlized braid like 032. So would snow dripping off his hat and the frost in his bucket. 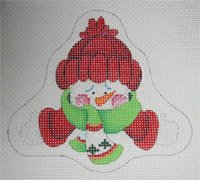 ORNAMENT - SNOWMAN IN HEART This item is on sale. On #18 canvas, this little guy is a perfect portable project, especially a winter project! Lots of opportunity to delve into your stash for fancy threads! On a Christmas green background, this fellow will jump off the tree! 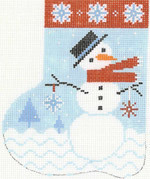 Size: About 4" x 4-1/2"
ORNAMENT - SNOWMAN IN HEART - BLUE This item is on sale. See description for other Snowman in Heart. PHOTO - BELL SHAPED ORNAMENT This item is on sale. Of course the photo isn't for sale at this or any price! It's just a visual to show you how the ornament makes up with the enlosed embellishments. See description of both the red and blue BELL-SHAPED ORNAMENTS nearby. PICTURE FRAME - EASTER EGG This item is on sale. On #18 canvas this is an engagingly-simple horizontal picture frame for your little Easter darling. Eggs offer great opportunity to dig into your stash and create some iced (remember those?) creations. 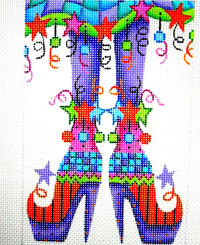 Squared background can be stitched in a Nobuko stitch with an overdyed blue/blue/lavender floss or perle. But hurry! Easter's early this year and this price won't be repeated. Size: 8" x 7" with interior opening of 5" x 3-1/2"
PICTURE FRAME - LILLIPAD This item is on sale. 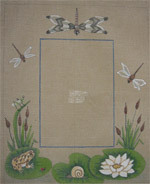 On antique #18 canvas Sandy Jenkins has creating a delightful picture frame depicting a very personable frog, a snail-snail and alily on lillipads at the bottom surrounded by cattails, grasshoppers, ladybugs and dragonflies. A tantellizing bargain at less than 1/2 price, this one won't stick around for long! 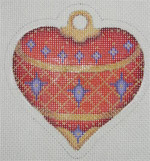 Size: Almost 9" x 11" with an opening of 4" x 6"
PINWHEEL HEART - A This item is on sale. On #18 canvas, this and the following pinwheels are fabulous in a table centerpiece on birthdays or any other spontaneous celebration. Stitched in overdyed cottons, stranded cottons and metallics and attached to a straw-type, painted stick, they will elicit lots of ooooh's and aaaah's from your patio guests. Size: About 3-3/4" x 3-3/4"
PINWHEEL HEART - B This item is on sale. See description for PINWHEEL - A.
PINWHEEL HEART - C This item is on sale. See description for PINWHEEL HEART - A. 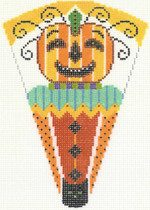 On #18 canvas, fill this little cone-shapped tussie mussie with corn candy, tootsie rolls and other goodies to hang in your Halloween wreath on your front door to keep the goblins away (or to welcome them!) So endearing! On #18 canvas, these very appealing Santa's beg to stand in a cluster as your table centerpiece or to act as the informer of your guest's place at the table. They just want to be there to showoff their exquisite attire created by your selection of threads, stitches and embellishments. Don't disappoint them! On #18 canvas, this candy-cane Santa is begging to be filled with red and white sticks, gum drops, peppermint rounds and other stocking candies and hung in the middle of your Christmas wreath to welcome the grandkids or neighborhood friends. Line in adorable candy printed fabric and back in a Christmas-red velveteen for an inviting welcome! 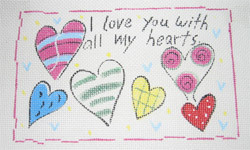 SAYINGS - HEARTS This item is on sale. Isn't there someone whom all your hearts love? On #18 mesh. Size: About 7" x 4-1/2". 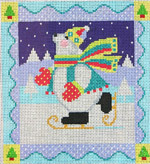 on #18 canvas, a very self-assured polar bear gliding across a ice pond in his new skates with gleaming blades. Would be stunning inset in an eggplant-dark purple velveteen pillow trimmed in lavendar and teal braid or as the flap of a luncheon or symphony or even eveningy shoulder purse, also in very dark purple moire with same color twisted braided strap and tassel. How chic! SNOWMAN - GINGERBREAD This item is on sale. This little fellow is so captivating, perfectly stitch "painted" by computer on #18 canvas. 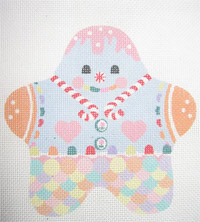 Let your creative juices flow as you interpret the candy hearts, gum drops, and eggs and candy canes with fancy threads and fancier stitches. He'll end up being your new best friend, so cute will he be! Size: About 5" x 5-1/2"
SPRING WREATH This item is on sale. A twig wreath designed by DEDE on #18 canvas to enhance the detail is woven with a soft turquoise ribbon and is interspersed with spring fauna and flora like crocuses and little bity bumble bees. About 8-1/2" in diameter, the highlight is a bird's nest harbouring a pair of robin's eggs. Mother robin is nearby chirping to you not to let this artistry of DEDE's slip by at this price. 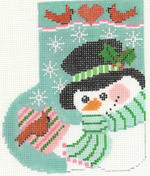 STOCKING - GIRL DECORATOR This item is on sale. On #18 canvas, this little lady is concentrating on topping off her tree with a bright gold star. She's been very busy wrapping the garland around the tree and keeping her puppy from eating it up and/or breaking the ornaments laying about. What an enchanting heirloom! Size: About 23" long with about a 10" opening. 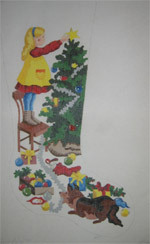 STOCKING - GIRL WATCHING SANTA This item is on sale. On #14 canvas, this little girl in her stripped Dr. Dentons is gazing at Santa as he bids her "Merry Christmas to all and to all, a good night." You don't want to miss the chance to pocket 75% savings on this one! Size: About 23-1/2" with a 9 opening. 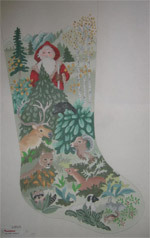 STOCKING - ST. SANTA OF ASSISI This item is on sale. 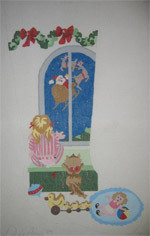 On #18 canvas, this Santa is herding a pasture-full of mountain animals through a snowy mountain pass. The animals are symbolic of peace, compassion and gentleness. You'll love it and the 1/2 price even more! See description for other sweater ornaments. On #13 canvas, these are light-weight portable projects, especially waiting in the carpool lines and especially in the winter! Great opportunity to use the Kalem or another stitch to produce sweater ribbling. And to gobble up some of the threads in your stash! Size: About 5" x 4-1/4"
TOPIARY TREES This item is on sale. By Master Stitchtress Barbara Elmore, and on #18 canvas, this scene of 5 different trees comes with a stitch guide and little 1/2 dimensional terra cotta pots which are affixed to the canvas after the trunks and the latticed background are in place. Framed, it could be showcased in a light and airy room. 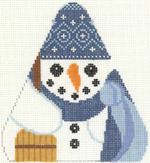 On #18 canvas, this triangular snowman standup is perfect on the mantle or in the window. 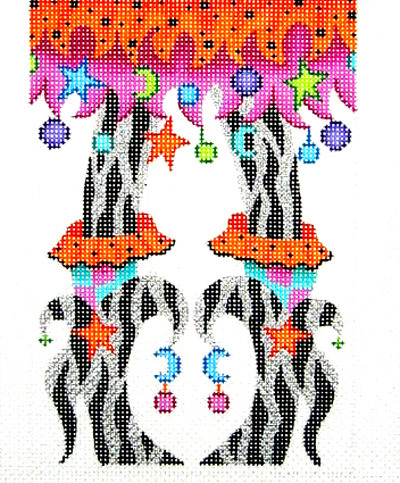 WALL HANGING - OUTER SPACE This item is on sale. For your future astronaut, a wall hanging featuring all kinds of planets, astroids, meteors, spacemen, sputniks, rockets, NASA logo, and many more motifs that will correspond with the individual alphabet letters. A challenge it will be both 4 you and him! A great utilizer of your creativity and stash and at 75% off, a stellar steal! Size: About 22" x 22"
WINTER WREATH This item is on sale. Like the earlier two, this winter wreath is on #18 canvas, to accurately depict the shells on the pine cones, the tops on the acorns, the pine needles, the oak leaves. Like the fall wreath, it screams for bronze, gold, butterscotch and taupe metallics, with the eye drawn toward the greens in the pine needles. The dead of winter is never going to be a better time to concentrate on this DEDE project and at this never-to-be-seen again price!